A letter from E. R. Trafford to James Edmundson Ingraham (1850-1924), dated August 23, 1882. 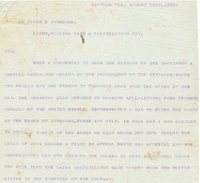 In the letter, Trafford informed Ingraham about the company efforts to buy lands from the U.S. Department of the Interior, an endeavor that was met with some difficulty because the governmental department "would not permit any one person to purchase more than 640 acres in one day" and "also refused to receive applications from persons outside the United States." Trafford also included a report of the lands in question. The report indicated the quality of the land, including its capacity for crop cultivation, its proximity to bodies of water, and its connection to lines of transportation and communication. The report highlights the questions and concerns regarding land investment during the period and also indirectly demonstrates the hardships faced by potential settlers in sparsely-settled regions. Original letter from E. R. Trafford to James E. Ingraham, August 23, 1882: box 54, folder 18, subfolder 54.18.8, Henry Shelton Sanford Papers, General Henry S. Sanford Memorial Library, Sanford Museum, Sanford, Florida. Digital reproduction of original letter from E. R. Trafford to James E. Ingraham, August 23, 1882. Anclote; Chase; Florida Department of the Interior; Florida Land and Colonization Company; Fort Gardner Island; Ingraham, James E.; Kissimmee; Polk County; real estate; South Florida Railroad Company; sponge diving; sponges; Sumter County; Trafford Tract; Trafford, E. R.
Trafford, E. R.. “Letter from E. R. Trafford to James E. Ingraham (August 23, 1882).” RICHES of Central Florida accessed April 24, 2019, https://richesmi.cah.ucf.edu/omeka/items/show/4308.